The St. Mary’s River, sometimes written as the St. Marys River, drains Lake Superior starting at the end of Whitefish Bay and flowing 120 km (74.5 miles) southeast into Lake Huron. For its entire length it is an international border, separating Michigan in the United States from Ontario, Canada. The most important area along the river are the rapids and the twin cities of Sault Ste. Marie (Soo), Ontario and Sault Ste. Marie (Soo), Michigan, with the most famous man-made feature being the Soo Locks. The rapids of the St. Mary's (Sault Sainte Marie in French) are just below the river's exit from Lake Superior. Two of the Ontario tributaries of this river are the Garden River and the Bar River. Other Canadian tributaries include: Fort Creek, Root River, Little Carp River, Big Carp River, Lower Echo River, Desbarats River, and the Two Tree River. The American tributaries to the St. Mary's River are: Gogomain River, Munuscong River, Little Munuscong River, Brimley River, and the Charlotte River. Before Europeans arrived, native Americans fished, traded, and maintained a portage around the rapids. French explorer Etienne Brule was the first European to travel up the rapids in about 1621. In 1641, Jesuit priests Isaac Jogues and Charles Raymbault ventured the same route as Brule finding many Ojibwa Indians at the rapids and named it Sault Ste. Marie (sault meaning "rapids" in French). A set of compensating works (dams w/gates) are located at the mouth of the rapids, which are used to control the outflow of water from Lake Superior. The works consists of 16 gates, half of which are on the American side, and the other half on the Canadian side of the river. They were completed between 1901 and 1921. This flow is controlled by the International Joint Commission. 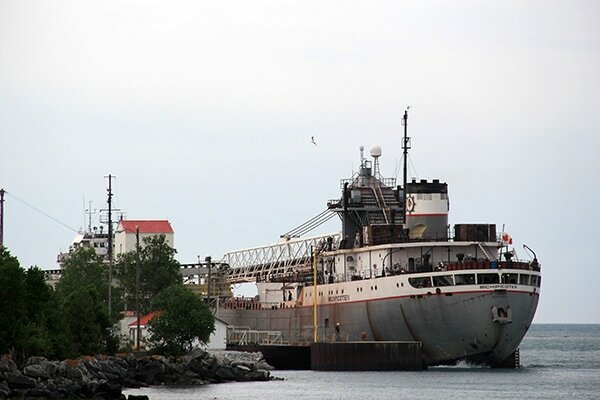 The Soo Locks, located between the two Soos on the north and south sides of the river, allow ships to travel between Lake Superior and the lower Great Lakes. The locks pass an average of 10,000 ships per year. This is achieved in spite of the locks' being closed during the winter, from January through March, when ice shuts down shipping on the Great Lakes. The winter is used to inspect and maintain the locks. The locks bypass the rapids of the St. Marys River where the water falls 7 meters (21 feet) from Lake Superior. Sault Ste. Marie (pronounced Soo Saint Ma-ree) gives its name to both the Canadian and U.S. cities at the site, in Ontario and Michigan, respectively. The Sault Ste. Marie International Bridge between the United States and Canada permits vehicular traffic to pass over the locks. There are two bridges crossing the River. The Sault Ste. Marie International Bridge, a steel truss arch bridge takes road traffic across the river. Directly to the west is the Sault St. Marie International Railroad Bridge which carries rail traffic on a single set of tracks. 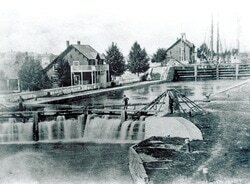 The U.S. locks form part of a 1.6 mile (2.6 km) canal formally named the St. Marys Falls Canal. They are owned and maintained by the United States Army Corps of Engineers. The first of the U.S. Soo Locks were completed in May 1855 by Erastus Corning's St. Mary's Falls Ship Canal Company, and is known as the American Lock. Competitive pressure led to the construction of a Canadian Lock in 1895. The locks were made a part of the Great Lakes Waterway system in 1959 known as the Soo Locks. Davis Lock was built in 1914. It is 411 meters (1350 feet) long, 24 meters (80 feet) wide and 7 meters (23.1 feet) deep. The Davis lock is used rather infrequently to lock light freighters, tour boats, and small craft when traffic warrants. SS James A Farrell was the first vessel to lock through. Sabin Lock was built in 1919. It is 1350 feet long, 80 feet wide, and 23.1 feet deep. This lock is decommissioned and no longer used. MacArthur Lock was built in 1943. It is 244 meters (800 feet) long, 24 meters (80 feet) wide and 9 meters (29.5 feet) deep. This is large enough to handle ocean going vessels that must first pass through the smaller locks in the Welland Canal. First vessel through was the SS Carl D. Bradley. Hydroelectric power is a significant by-product of the St. Mary’s River. The Edison Sault Electric Hydroelectric Plant, located at the eastern end of the Sault Ste. Marie, Michigan Power Canal which runs through the city south of the American locks, is the longest hydroelectric plant in the world at 1,340 ft (408.4 m) in length. The plant consists of 74 three-phase generators capable of generating 25 to 30 MW. It was completed in 1902, and consists mostly of the stone left over from the excavation of the Sault Ste. Marie Power Canal. The Power Canal is used to power the Edison Sault Electric Hydroelectric Plant at its eastern end. The canal separated downtown Sault Ste. Marie, Michigan from the mainland making it an island. It was begun in September 1898 as the Michigan Lake Superior Power Company Canal, but completed by Edison Sault Electric Company in June 1902. Measured from its headgates to its end at the power plant, is is 2.25 mi (3.6 km) in length, between 200 ft (61 m) and 220 ft (67 m) wide, and 24 ft (7.3 m) deep. The water runs down the canal at speeds upwards of 7 MPH. The United States Army Corps of Engineers owns and operates a hydroelectric generating plant directly north of the American locks. Finally, the Francis H. Clergue Generating Station, owned and operated by Brookfield Renewable Energy, Inc., is a hydroelectric generating plant located directly north of the Canadian lock with a generating capacity of 52 MW. It was completed in 1981. Several Islands are encountered by the St. Mary’s River on its way south to Lake Huron. Sugar Island, St. Joseph Island, Neebish Island and Drummond Island all contribute to the character of the River. Fort St. Joseph was built on St Joseph Island in 1796 to protect a trading post, and ensure continued British control of the area. The fort fulfilled its role in the War of 1812. 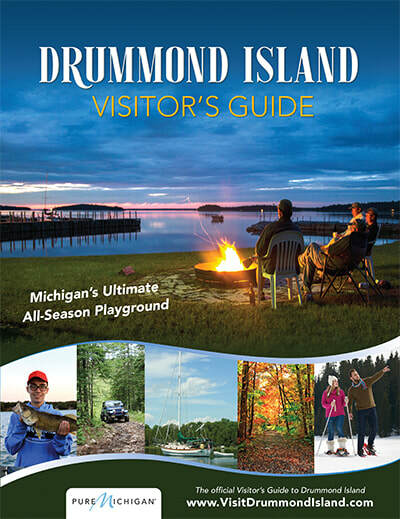 It is of particular interest to note that the cargo carriers that travel the St. Mary’s River into and out of Lake Superior must pass by Drummond Island and cross the Drummond Island ​Ferry’s daily route. 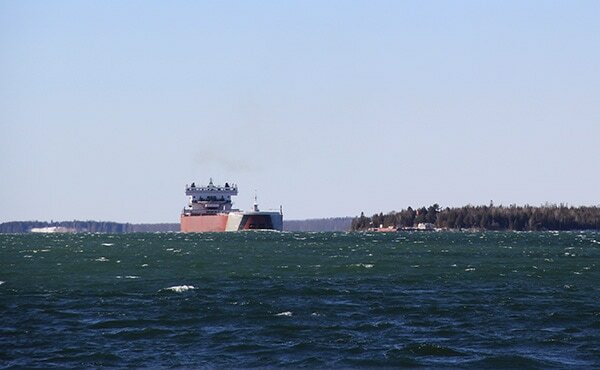 You may see a few of these giant vessels while traveling along the shoreline while driving on M1-34, waiting for the ferry, or ​even cruise next to one as you cross the St. Mary's River aboard the Drummond Island Ferry.